After lunch, I decided to transfer the chickens back into the Puppy Coop. It was such a nice day, 40 and sunny, so it felt good to be out shuffling things around. I grabbed all my dog supplies, crates and tunnels and beds and toys and hauled them to the bunkhouse. The roost had been left in place… That’s where much of the supplies had been stored, so nothing to change with that. There were no nest boxes… so I made one. One was all they had used in the tractor… we’ll try one for a while. 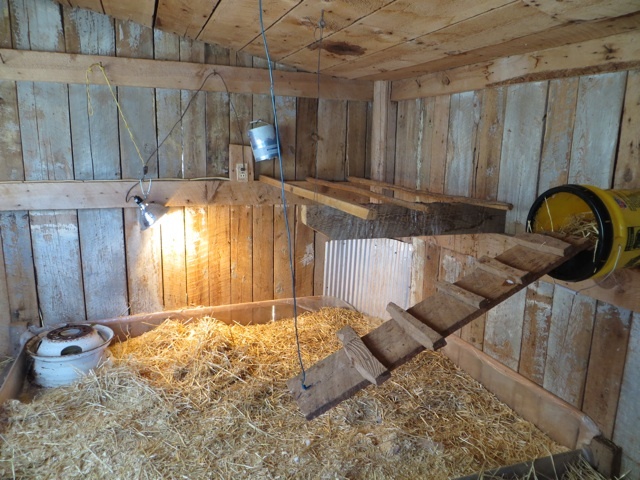 Since he was in the shop, Vernon grabbed his sawzall, and from a 5 gallon bucket, a couple of screws and a brace board, a new nest box was built! I simply screwed it to the wall! Time to move the chickens! Now here’s where life got interesting! Back at the chicken tractor, I lifted the lid on the nest box end and there lay my little red hen on top of the white hen! She slowly stood, and there was a perfect little brown egg protruding from her hiney! She stretched over the lip of the box, and the egg fell out and landed with a thud. It didn’t break, and I thought SCORE! How many people have actually SEEN an egg being laid? I’m definitely blogging about that! Now the white hen is still laying there… So I reach in and gently lift her from the warmth of the box. I tucked her in my arms and began walking down to the Puppy Coop through the ice and snow. I move my hand to get a better grip on her leg in case she tries to flutter away and realize she’s *very* warm. Then I think, no, she’s *wet*… Oh, crumb, she’s pooping on my hand! Then an instant later, it *really* hits me… She’s laying an egg! Seconds later I have a wet green egg in my hand as I’m still walking to the Puppy Coop! I just had to laugh! Oh, this is *definitely* a story for my readers! I’m at the coop and my chicken wired Dutch doors had a run in with a dog not too long ago, and I have yet to repair it, but neverfear, the outside wood door works, so I’ll just swing it shut a bit behind me, so the white hen won’t run towards the light, and out the hole in the Dutch door! 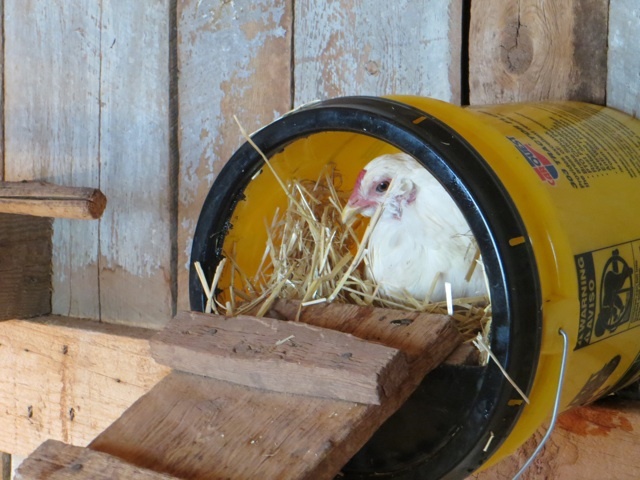 I place her in the bucket box and she’s a happy camper… Clucking and moving the straw around like a happy chicken! After a photo or two, I turn to leave. The door had closed more than I thought…and I give it a shove. It doesn’t budge . I rattle the handle a bit. I’ve just locked myself in the Puppy Coop! My pocketknife that I always have with me? In my jeans I wore yesterday in the house. The dog door? I had just wired it shut from the outside. 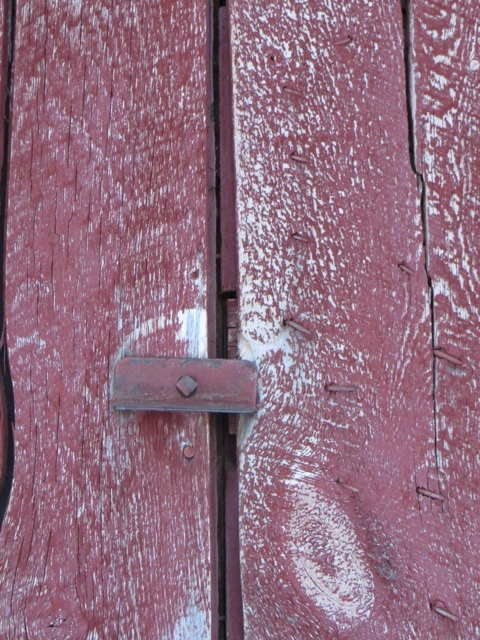 The hinges on the wooden door? On the outside. Grabbing a piece of wire, I tried to slide it through the gap in the door. No go. I couldn’t even see where the latch was, much less slide something in the right place to lift it. Now *this* is quite the story for the blog! I rattled the door again. Vernon had left to go down to the field… No way to contact him. Hmm. I wonder if the UPS man would be coming today? Lucas and Elsa are locked in the house, but Dally followed me! Dally? Dally? A wet nose pokes through the tiny hole in the bottom of the door. I stuck my fingers through, and a wet tongue reassures me. Dally! Get me out! Paws up, Dally! Paws up! Dally, Timmy’s in the well! Dally! I peek through a crack in the door, she sits, ears perked, watching the door. My plea of Timmy’s-in-the-well, produced no result. So much for movie endings. I *can* wait. Have a seat, enjoy the special bond that White and I now have, the sharing of “child/egg/birth”… but there’s a party tonight I was going to attend with a friend. Vernon won’t be back until dark, and I don’t want to miss the party. 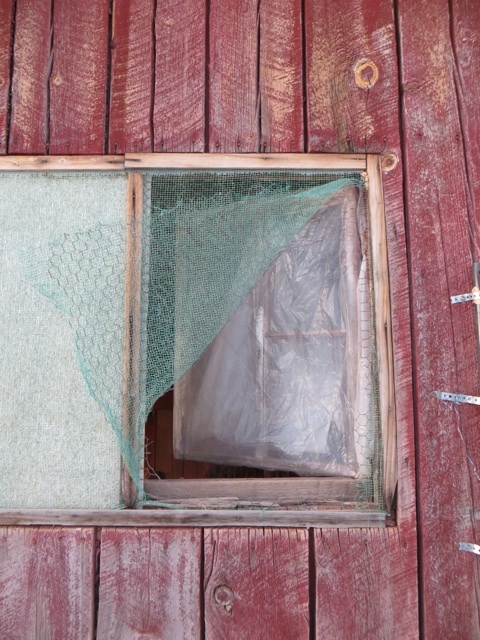 Maybe if I cut some of the chicken wire on the window, I can reach around the corner of the building and flip the lever? By golly, I’ve got pliers in my pocket from wiring the door shut… And I clip the wire to put my arm through. Well, duh. My arm would have to be 5′ long to reach the lever…what was I thinking? I’d have to be Stretch Armstrong to have opened the door! Between laughing manically (and probably maniacally, as well), and debating which exit route will cause the least damage that I will have to repair… I decided to just go for it. I had three more chickens to catch and transfer and a shower to take before long… I started clipping away. Within a few minutes, I clipped around the edge of the window. Forget doing just a little bit. I’m not a little girl. I folded back the chicken wire and climbed through. And, yes, it *was* the most yoga stretching activity I’ve done in a while, but I worked my way out! I captured the remaining hens, took a shower, and attended the party. And what did I accomplish this afternoon, besides three unbelievable chicken tales? I realized, I don’t like being cooped up!